and i just thought i’d share about these books a bit, because, as it turns out, they’re all linked in some way and all three have effected me in a profound way – existentially. the nice thing is that two of them were gifts too, which means i now have awesome mind-reading friends who know exactly what kind of garbage to put in my brain. 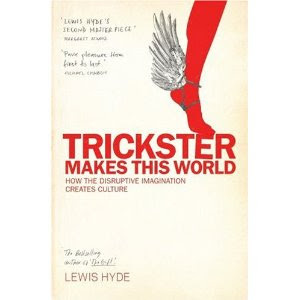 the trickster makes this world: how disruptive imagination creates culture lewis hyde. apparently there’s quite a famous book by lewis hyde called the gift. i’d not heard of it, so this author and his second big title was all new to me. i was a little dubious about that subtitle, but i peeked at the first page and was hooked from the get-go. in fact, i cheated on the book i was reading at the time – ditched it in favour of the first chapter under the covers. ooh er..
basically, hyde uses stories in mythology about various trickster characters, to show that the wiley, crafty and chaotic traits of the trickster are a vital part of society. He then matched those traits in stories/principles with the traits of the artist in modern society, as a vital trickster character that keeps everyone on their toes. some of the other areas that i found fascinating included place of chaos/dirt/upheaval (or images thereof) in orderly society; the need for shame/shamelessness in social cohesion; and the skill of a trickster to play with perception, whilst holding the order of perception dear. the actual writing flow of the book was slightly problematic, but the way he teased out his examples, and the kind of stories he chose as illustration was so good, that i could forgive the lapses in writing craft (just like you’re doing now). there is an admirable element of playfulness about the trickster which hyde kept reiterating (and about which i have a creeping doubt that i have lost recently). it was inspiring to get a bit cheeky, a bit naughty and throw caution to the wind a little. nothing reflects a security in the order of ‘things’ than acting as though they’re not important. the book was an excellent reminder about the role of chaos, entropy, mishap, coincidence, serendipity and mistake in evolution, change, growth and innovation. trickster also served as an illustration of the position stories, myth, artifice, imagination and fiction have in society as a way to abide by principle and establish a code of conduct. whilst i was reading the trickster, i had an invigorating discussion about science and religion with a friend who had just finished the canon. we were the only ones in a club in stockholm, laying on a mattress and shouting over 105 rpm techno at 95dbs, debating the importance of scientific thinking and spirituality and everything in between. it was a brilliant moment in our friendship, and the momentum to read this fantastic book. its premise is to concisely and adroitly recap the main tenets of science and scientific research, to upskill adults in the basics. especially after they have convinced themselves that they know nothing about science. as a science writer, angier surveyed a stack of scientists and academics for their ‘top 5 things to know about your field’ type information. each chapter covers the principles of each ‘flavour’ of science, distilling the history of its knowledge and how it relates to life, the universe and everything. scientific thinking, probabilites (maths), calibration (maths), physics, chemistry, evolutionary biology, molecular biology, geology and astronomy are all covered – from their history to current thinking. and of course, she covers where religion and astrology clash too. in fact, sometimes her subjectivity around the subjects of religion and even intelligent design, and her outright derision at astrology show her cards a little. in the last two years of high school, despite being a A+ english student and studying 3 languages, i decided that i wanted to be an industrial chemist. so i moved to sydney and started a science degree. turns out it was much harder than i thought: i was convinced i was a failure (thinking that 72% on an assignment was akin to disaster) and the fact that my week would start at 8am on a monday with a mathematics class on matrices in a stuffy room, was a recipe for flunk-out. i bid science a swift adios and turned to print and art instead. i kept a secret crush on mathematics and chemistry through those years and so reading the canon was like falling in love again. all the old lessons came flooding back, with greater links to subsequent experience or knowledge. the picture of how much everything is related scientifically was quickly seen and i just churned through the book. 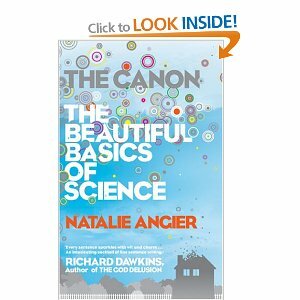 thanks to a catholic education, my knowledge of the details of evolution had been a bit loose, so this book was a mind-blowing and yet super easy-to-read lesson on how far we go back (like, to the beginning of cells) and same with the big bang theory. the idea that cells’ innate mission has always been to respire, replicate, excrete, communicate and coalesce is mind-boggling to me and is influencing my next read. i feel like i know more about science now and that i can’t hide behind the ignorance of learning it in high school – it’s part of a general knowledge and understanding about life. in the same way that i feel it’s necessary to understand concepts in philosophy, economics, politics and art in order to be a well-rounded citizen (how neo-classical of me). and i can see why my friend gave this book to me (and six of his other friends). i feel similarly – like everyone who has let their science knowledge lapse, should pick this up and feel like they know a little more again. in fact, it was so profound that i ended up in a two-hour conversation with a paleonto-bio-mechanic about his PhD and i held my own! yay me! i stopped and started with this one. i got distracted by shiny pop non-fiction. 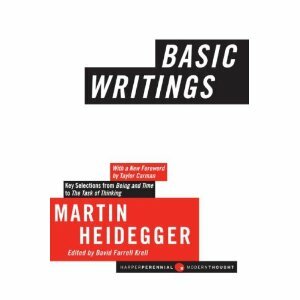 but now that i’ve read both of the previous books, i feel like my take on heidegger is going to actually be better prepared. especially after reading about molecular biology and the big bang (which trace the history of the life, the universe and everything, back to the beginning – before there was even ‘let there be light’). After reading about these things, i keep asking myself ‘why did life begin? – what is the purpose of Being..
heidegger’s big area of questioning/interrogation/query (words which he unpacks as a sign of being) is about Being, with his famous work Being and Time (Zeit und Sein). It is the very capital-B being and different from existence and the nature of being. So far, he’s primarily interested in the meaning of Being, and not necessarily the purpose, or the drive behind it. But i’m only a little of the way through so far. thanks to the simplicity of the english language, there are a lot of being/Being/beings in the text, which are translations from Dasein, Dass-Sein, Was-Sein and Da-Sein. All different relationships to Sein ( the action of being). heidegger unpacks his questions in a very methodical way, and makes a lot of references to other sciences that tackle existential concepts (which is why i feel like reading The Canon has unexpectedly augmented my understanding of Being and Time). It has been quite interesting to see the history of his thinking around it and the critical ‘evolution’ of such ideas throughout philosophy and ontological research. on a more egocentric level, are there levels or classifications or even species of Being? what does the Being of an artist translate to and is it fundamentally different to the Being an accountant? or does it follow biological framework – that the Being of a vertebrate is different to the Being of an invertebrate, but has mutual elements of Being, both being from the animal kingdom and eurakyrotic domain. Or is there just one type of Being?